When you want to combine beauty and durability in an outdoor staircase or a set of steps, natural stone flagstone steps are the most durable and beautiful material available. Even when used frequently, flagstone steps will not wear, break or need repair. And, with the best selection of Atlanta flagstone suppliers, we can help you create a great looking staircase that will not only accentuate your property but may never need replacing for the life of your home. With the ease of simply putting down these beautiful pieces of natural stone in a step pattern, you can create a staircase that can be used immediately. There is no need for cement or mortar. You just place the stones and you have an instant outdoor staircase. At Alliance Stone we offer our customers Tennessee Flagstone Step Treads because we’ve found that these are the best natural stone steps for the uses most of our customers put them to. We sell Tennessee Flagstone Step Treads in the following sizes, with the 118” x 36” and 18” x 48” being the most popular sizes. With over 14 years in the natural stone business, Alliance Stone prides itself on providing the best possible North Georgia natural stone products and service in the area. We live and work here and consequently take pride in the offerings in natural stone that we promote to both our homeowner customers and landscapers. In every order we take and every customer we serve, we follow our adopted philosophy that we are “taking care of people so you can take care of business. You can trust us to direct you in the right direction for all your natural stone needs. When you need flagstone step treads, we at Alliance Stone want you to purchase them from us, knowing you are getting a quality product. 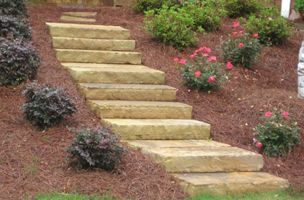 Contact our Atlanta Flagstone Step Treads Company at Alliance Stone to purchase your next natural stone products.